In 1862 France bought the bay of Obock for 10,000 thalers from the Sultan of Raheito. 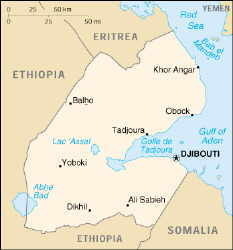 Later it occupied the regions of Tadjourah and of Djibouti. First known as French Coast of the Somalis (1892), this strategic position at the exit of the Red Sea (opposite to Yemen) was named by the French the “Territory of the Afars and the Issas.” It was given its own local government in 1967 before becoming inde-pendent under the name of the Republic of Djibouti in 1977.